Dude, you need to get checked. 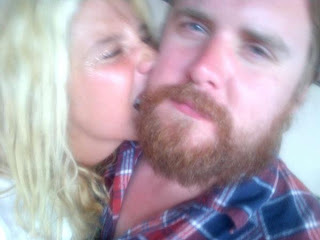 Ewan Currie of the Canadian band The Sheepdogs was snapped getting his face bit/licked/kissed by that dirt bag we know as Ke$ha. Ke$ha tweeted this picture live from Coachella. Why Currie let that chick that close to his face is beyond me. I know The Sheepdogs are big burly men who probably shower only once a week...but Ke$ha is a whole other level of stank. I think this post just made it into my favourite top three xoxojes posts. Just sayin. AB.